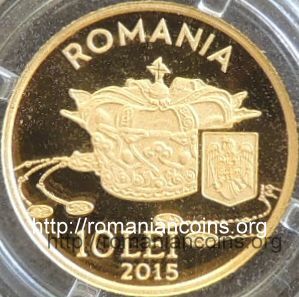 Obverse: ROMANIA, coat of arms of Romania, face value 10 LEI, year 2015, crown of queen Marie of Romania Reverse: queen Marie wearing her crown, inscription "COROANA REGINEI MARIA" meaning "CROWN OF QUEEN MARIE"
- the crown of queen Marie (2015). 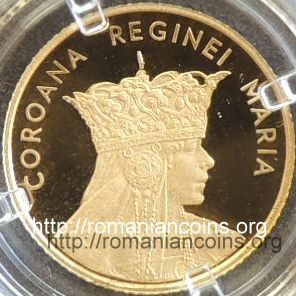 The crown worn by Queen Marie at the Alba Iulia crowning, at October 15th 1922, appears on the 25 lei 1922 and on 50 lei gold coins, and also on the anniversary 100 lei coin from 2010. The crown was manufactured at Paris, at the jewelry firm "Falize", after the sketches of the Romanian painter Costin Petrescu. He inspired himself from the crown worn by Lady Elena - Despina (wife of Neagoe Basarab, ruler of Walachia between 1512 and 1521, daughter of the Serbian despot Jovan Brankovic) on the votive painting of the bishopric church in Curtea de Argeş. The crown has radiate arms, ending with fleur-de-lis. The crown has many inserted gems. At each side is a pendant, with a disk with three rows of beads ended with a "crux gammata", a cross with arms shaped like the Greek letter gamma. On the disks are represented the Romanian and respectively the Great Britain coat of arms (the last, as a homage to the British origin of Queen Marie). Atop is a crux gammata. From the artistic point of view, the crown belongs to the 1900 style (Art Nouveau). The crown has almost 2 kg, 17.5 centimeters in diameter at the bottom and 18 centimeters in height. Nowadays it is displayed at the National History Museum in Bucharest, in the Treasury Room.